(EDITOR'S NOTE: In the article below Alberto Corbino gives us a view of the Solidarity Economy movement in Italy. He will be doing a lecture tour in the US this summmer. The idea is to continue discussing the subjects he reports on in the article here at universities, colleges, and centers of solidarity economic justice movements. There’s a lot more to say about the Italian people’s fight against the international crisis and shortsighted politics than this article could explore. He explains: "We do have our Occupy places like the “NO TAV” in the North of Italy (against the high speed railway) But, besides and beyond that, we have hundreds of solidarity economy experiences, even in difficult territories threatened by organized crime. The social reuse of mafia confiscated assets is a good example to show that change, from the inside, is not only a dream." In the last 20 years Italy has been witnessing the development of several practices of solidarity economy. Some of these practices have proven to be very effective in terms of economic sustainability, and have therefore been improved and reproduced in different regions and territories. The 1986 Ukraine Chernobyl nuclear plant accident, which made Italians think over the quality of environment and food. Besides the radioactive cloud threatening Italian skies, Italy was importing from that region most of its wheat to produce pasta and bread. The 1992 political scandal denominated Mani Pulite (Italian for clean hands) that saw about a third of Italian Ms = Members of Parliament under judicial investigations for bribery and other similar crimes. The scandal left Italians with a sense of deep mistrust in representative democracy. In response some Italians sought other ways to build a more participatory democracy. Still, after 20 years, Italian politics is still perceived as very corrupt. As a result some grassroots movements have felt compelled to join the representative democracy arena (with good results in some regions). The 2003 Parmalat Corporation bankruptcy, which turned out to be a real fraud for thousands of small shareholders, was committed with the complicity of some major banks. Italians realized that the leading financial system was not there to support them but to strangle them. some mayors of small/medium cities and some small to medium entrepreneurs, who grasped the value of responsibility and sustainability, slowly joined the movement. From the academic world some began considering the solidarity world beyond its volunteering aspects, thus conceiving important tools to convert principles into practices. All of these changes began to take place in spite of the reluctance of both the political and economic systems to see these successful innovations and experiences as examples to follow. Second, there were the Catholic practices of solidarity values. This had produced a widespread network of associations, which often evolved into social enterprises/cooperatives. For example, in 1883, the first Italian Cassa Rurale (Rural Bank) began operations in Padova to relieve the poorest people in the countryside and free them from usury. By 1897, just 14 years later, 904 Casse Rurali were up and running. Of these, 779 were of Catholic background whereas only 125 were of liberal background. Among the many innovative practices in the Italian solidarity economy revolution, I think five of them standout. Social cooperatives were established by a 1991 national law with the aim of favoring social integration especially through social, health and educational services. The specific intent was to integrate people with any kind of physical or mental handicap into the economic fabric. Type A Social Cooperatives are those who deliver social, health and educational services to people in need . Type B cooperatives, and here lies the real innovation, can work also in other economic fields (such as agriculture, industry commerce, services) and must hire at least a 30% of people with handicap in their staff. The social cooperatives that formed to do this work, in turn, received some tax incentives. Today there is a growing number of both A and B type Social Cooperatives, 9,338 by the end of 2009. They gather over 332,000 members and employ a work-force of 62,000. In 2009 they grossed over 3 billion euros. In addition to these employees, thousands volunteers help deliver services to millions customers. A Banca Popolare Etica meeting. Before Italy’s solidarity movement got rolling only 29% of its nonprofit organizations had access to the credit system. They were rich in human capital and ideas, but poor in financial resources. In 1995 some of the major Italian nonprofit organizations joined together to develop a cooperative to raise money to start an “Ethical Bank. ” Their aim was to raise enough money to build a bank that would a) provide the needed credit to the nonprofit world, and b) meet the need for transparent and ethical investments. The success came in 1999 with the opening of the Banca Popolare Etica (Ethical Popular Bank). The BPE provides its customers with all the usual services, but with a totally different inspiration: to be ethically oriented, even while being a for-profit organization. The bank in fact guarantees access to credit for subjects once considered “unbankable.” It provides financial support for good ideas with social value in several sectors of the solidarity economy regardless of their financial guarantees: international cooperation, social cooperation, environmental protection and cultural activities. The experiment has succeeded, and it is now opening new offices all over Italy. Today it has over 36,000 shareholders and 5,200 beneficiaries. This success is due to people having come to understand that a fair and ethical financial system is an integral part in developing a fair and sustainable community. to create cooperation among shareholders, managers and employees. GAS (Gruppo di acquisto solidale – Solidarity Purchase Group). A GAS is a made of a group of people (20 families, on average) who organize to purchase directly from the producer. The first GAS was created in 1994, and the official network now numbers over 850 GASs (Retegas.org). The main aim is not to save money but to establish strong consumer-producer relationships grounded in a real sense of one-on-one trust. In this kind of relationship convenience is gained through cooperation instead of competition. In many cases, the consumers and the farmers/producers become partners, joining together in both the planning and decision-making processes as well as sharing in both the benefits and risks. environmental (less waste), landscape, and biodiversity protection. It has also seen the creation of DES – Distretti di economia solidale - Solidarity Economy Districts, which involve not only GASs but also local producers, institutions, all of which are committed to create a more human-friendly economic and social environment. Italy has 8,092 municipalities, 72% of which have less than 5,000 inhabitants. Deep government funding cuts and the 2005 “devolution law,” which assigned more tasks to local authorities, have hit all of these municipalities hard. They have had to re-think their budgets in order to balance the decreasing incomes with the increasing basic services costs for their citizenship. Smaller municipalities found this to be a particularly difficult task. On the other hand, some municipalities had already developed good practices for meeting and matching economic, social and environmental sustainability. In 2005, four municipalities set up the Association of Comuni Virtuosi (virtuous municipalities) to share these good practices of local governance. Today the Association has 55 members. Implementing Public-Private Partnerships, which is quite a new scenario in Italy. In Italy, mafias have always made very profitable businesses. One of the most effective tools against organized crime syndicates is to strike at their patrimony by confiscating their assets (real estate properties and firms of all kinds). So far, some 11,360 assets have been confiscated, including 1,400 firms. In an effort to manage such a huge quantity of assets, a special government agency (ANBSC) was created. Once these assets are “officially” confiscated, they are entrusted to cooperatives, local authorities and to non-profit organizations that, in turn, utilize them either to produce and sell goods (especially wine and food), or to deliver social services to the community. The best has yet to come. In these times of crisis, the alternative system is proving to be solid and gaining a growing consensus among common people that understand that a change in the paradigm of basic values is needed. Also other European countries are trying to walk along an alternative economic path. In Germany some small municipalities managed to produce their complete heat and electricity supply from bio-energy. One famer out of 5 in France chose to sell directly its good through the farmers markets, thus increasing their income and improving the quality and variety of goods. 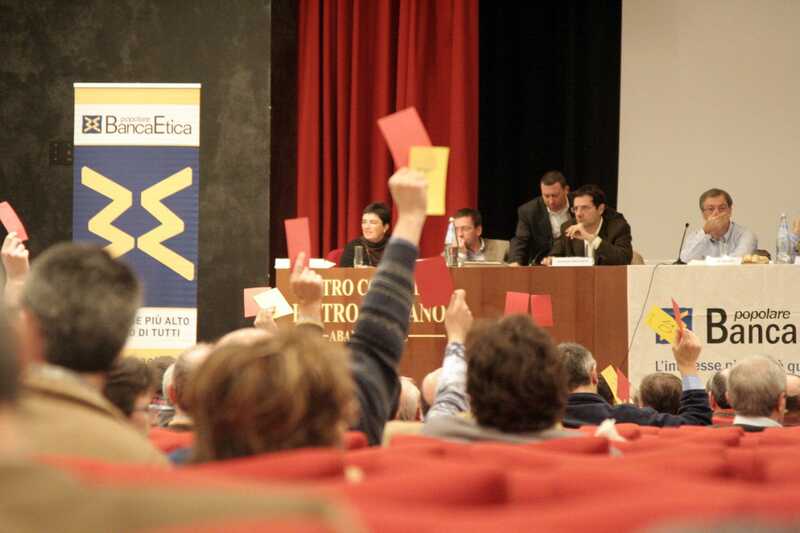 To increase the influence in the decision making process, these pioneers try to create international networks, such as FEBEA, the European Federation of Ethical and Alternative Banks, a non-profit organization created in Brussels in 2001 by some European alternative Banks (including Banca Etica). Today, FEBEA has 24 members from 12 countries. I am convinced that the U.S. cooperative movement may have a lot to learn from the Italian slow revolution and how it is changing the Italian economy and social movement. I will be very glad if this article could spark further occasions of discussion: learning and understanding are essential to change. Mani pulite was a nationwide Italian judicial investigation into political corruption held in the 1990s. It all began in February 1992 when Milano public prosecutors arrested the CEO of Pio Albergo Trivulzio, a public institute devoted to social assistance for accepting a bribe from a cleaning firm. Mani pulite led to the demise of the so-called First Republic, resulting in the disappearance of many parties. The enormous corruption system that was uncovered by these investigations all over the nation was usually referred to as Tangentopoli (bribesville”). Devolution is the statutory granting of powers from the central government of a sovereign state to government at a subnational level, such as a regional, local, or state level. Devolution can be mainly financial, e.g. giving areas a budget which was formerly administered by central government. However, the power to make legislation relevant to the area may also be granted. Dr. Alberto Corbino is a human geographer, born and raised in the South of Italy, a beautiful but complicated place. He is currently teaching Economics of Organized Crime and Social Innovation at Arcadia University Centre for Italian Studies in Rome. In the last two years he has worked as part-time professor in Environmental economics and law at University of Naples - Federico II. For some 20 years, as a professional and a community builder, he has been working to understand how the theories of sustainable development could be turned into practices, thus becoming an expert on the co-existence of legitimate and illegitimate systems of government and economies. He transformed this experience into training processes for students of any grade, a job he loves: in his vision, learning and understanding are essential to change. 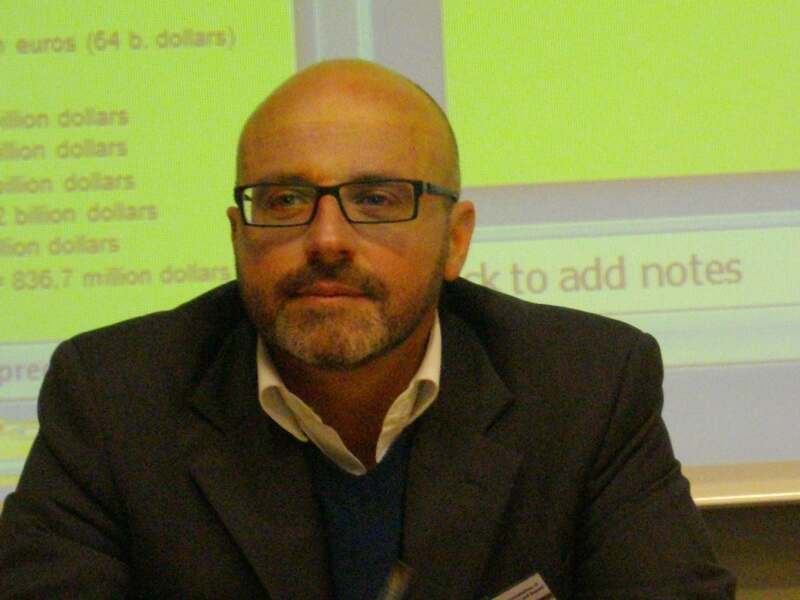 In 2004 Dr. Corbino completed an executive program in Innovation in Governance at Kennedy School of Government, Harvard University, MA; in 2000 he received a Ph.d from the University of Padua and in 1992 he graduated with honors in Political Sciences at University of Naples – Federico II. In 1998 he worked as national expert at the European Commission in Bruxelles as coordinator of IMPEL - European Network for the Implementation and Enforcement of Environmental Law. In 1999 he co-funded the Campania regional branch of the NGO Mani Tese (fighting the imbalances between North and South of the world); he currently manages the non-profit organization Il Vagabondo (The tramp) to promote responsible tourism in the South of Italy. He volunteers for Banca Popolare Etica to make the social assessments of projects.